I have a new pattern in my pattern shop called Gold Star. This is a quilt I made a few years ago for a publication and am finally publishing the pattern in PDF form. This version of the quilt is 42″ x 56″ and has so many options as far as style goes. The Kona solids give it a really modern feel, but the block is so traditional that by changing the fabrics, colors, etc. it could have another look. You may recognize the same design I used to make the Shimmer Stars a few month ago. I used the same design and construction techniques, but scaled the pattern down to 24″ x 32″. The PDF includes instructions for both sizes. Click here to order the pattern in instant PDF download for only $7.00. I’m adding this one to the list of patterns I want to remake in an entirely different color scheme. In other news, Lula Magnolia is now in stock in fabric shops. 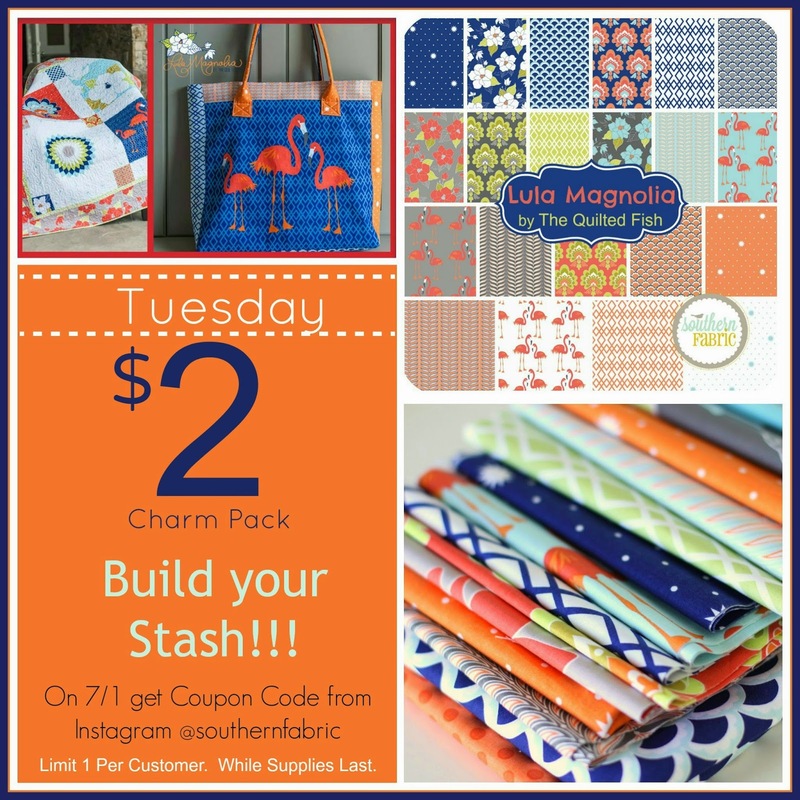 And today only (July 1, 2014), Southern Fabrics is offering Charm Packs of Lula Magnolia for only $2 with the coupon code found on the @SouthernFabric Instagram account. Those charm packs would be perfect for the Lula Magnolia quilt tutorial. You can also find Lula Magnolia fabrics from Fat Quarter Shop, and Stash Fabrics. I especially like the shimmer version! What a beautiful quilt Amy! I love the gold and blue together! You know, you said the Kona solids give the gold and blue quilt a modern feel, but the first thing I thought when I saw the picture was that the colors gave it a retro look. At any rate, love it!! What a great pattern, Amy! I love how it looks much more intricate than it actually is to construct – nice work!! Hi Amy!<br />Do you know if there are kits available for the Lula Magnolia quilt? I am really want to make that one. What a perfect picnic quilt! I am on the phone with Fat Quarter Shop, but they don&#39;t appear to have everything in your quilt. <br />Thanks! Ohhhh I love the Lula Magnolia line. Beautiful. Any tips on how to make this larger? Just purchased and am not skilled at guessing! I love this pattern! I went to your store and could not locate it. Is it unavailable now? I am in the process of updating my shop (was limited as to the number of patterns that could be listed in the old shop and some had to come down when I introduced my four new ones. The new shop should be up this weekend! I will email you the link as soon as it is!